I am an illustrator specializing in battle scenes from ancient times to modern times, for work and as a hobby. Seeing Akira Kurosawa's epic films 'RAN' and 'KAGEMUSHA' on the same week in 1985 was a turning point. 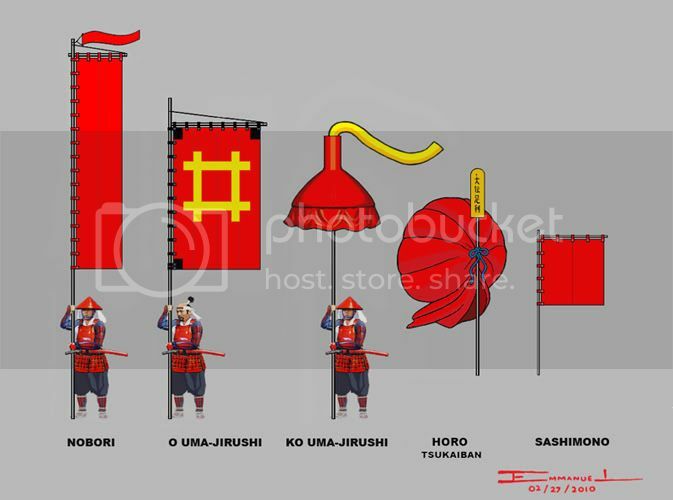 I became fascinated with illustrating samurai armies, but in order to do them accurately I had to start what might become a lifelong pursuit, the search for armour and especially the banners and standards representing centuries and generations of a vast number of samurai armies. These are just some samples of my ever growing collection of heraldry sets. They are constantly being updated with corrections and additions as new information become available. I am grateful for many individuals who have helped me 'complete' many of the sets. NIWA NAGAHIDE (1535-1585) , served Oda Nobunaga and fought in many of his important battles. 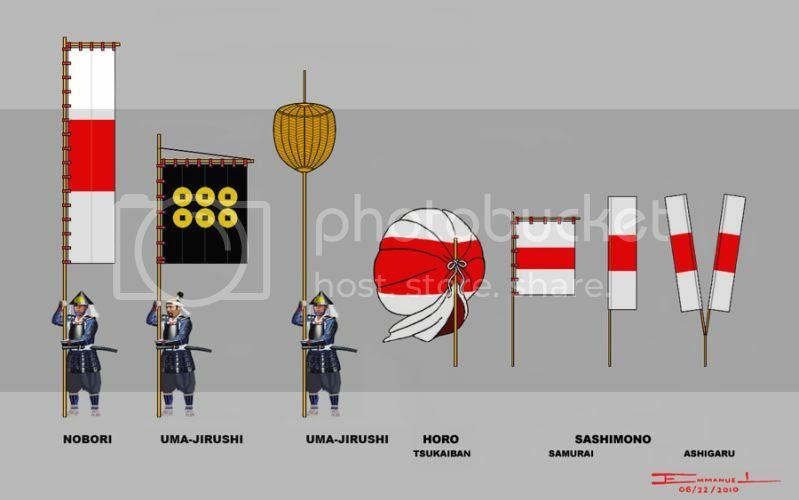 His banners represent the extreme in the types of flags used by samurai. From a simple straightforward flag, to an elaborate 3d object like a TREE! The nobori is described in Stephen Turnbull's 'The Samurai Sourcebook'. The sashimono and uma-jirushi are illustrated in Rekishi Gunzo books. NIWA NAGASHIGE (1571-1637) Son of Nagahide. He served Toyotomi Hideyoshi and fought at the Battle of Nagakute. He sided with Ishida Mitsunari during the Sekigahara campaign. He would go on to serve Tokugawa Ieyasu during the siege of Osaka where he reinforced Uesugi Kagekatsu trying to hold on to Shigino fort. (Nagashige's banners would look familiar to Europeans, the 'X' standards look similar to the current flag of Jersey in the Channel Islands). Nagashige's banners are included in O Uma-jirushi, a scroll showing the banners of those who served the Tokugawa. Stephen Turnbull described a white serrated sashimono in The Samurai Sourcebook, but the O Uma-jirushi scroll show a black serrated sashimono. A copy of O Uma-jirushi in the Kuroda collection show a white serrated sahimono. 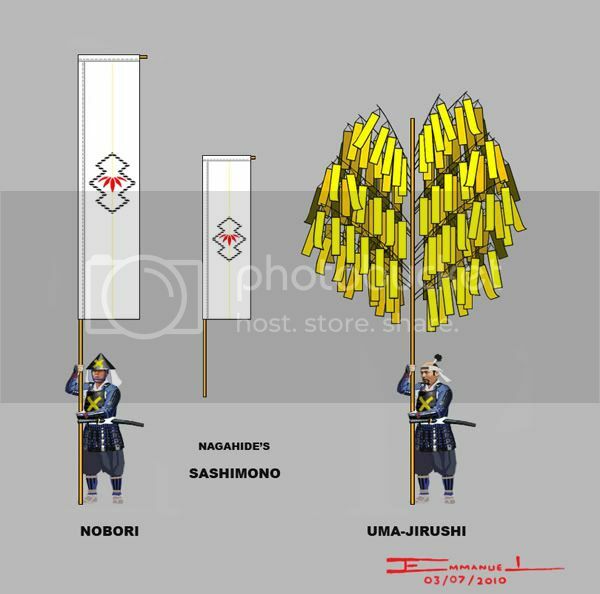 I can only make a guess as to the actual 'size' of the Niwa triple sashimono for their ashigaru, based on the illustration in 'O uma jirushi'. 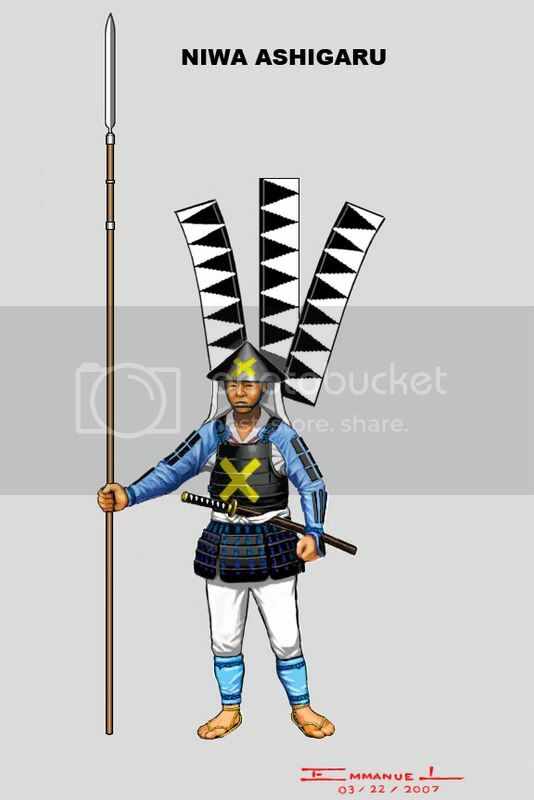 The Okegawa do is more accurate, based on photo of actual Niwa ashigaru armour. The jingasa is missing, so the jingasa with Niwa 'X' is an assumption, based on common practice for 'complete' ashigaru armour. NOTE: Research is ongoing, so updates and corrections will be made when necessary. Your attention to detail along with your artistic skills never cease to amaze me! Good stuff! Thanks, Obenjo. Nate, the 'X' was so much simpler than the 'TREE'!. Speaking of tree...KOMYO GA TSUJI ended last Saturday, and Furinkazan's subtitled version has not started yet. I miss Nakayama Yukie already. YAMAUCHI KAZUTOYO (1546-1605), he served all three 'Great Unifiers'. He led troops for Oda Nobunaga at the battles of Anegawa and Nagashino. He fought his last battle serving Tokugawa Ieyasu. He assisted in capturing Gifu Castle and led 2,000 troops in the rear guard in the Battle of Sekigahara. He was rewarded with Tosa province where he was forced to seek the help of Ii Naomasa to put down rebellious former Chosokabe retainers. YAMAUCHI TADAYOSHI (1592-1664), son of Kazutoyo's brother Yasutoyo. He succeeded Kazutoyo as daimyo of Tosa. He served Tokugawa Ieyasu at the siege of Osaka Castle, leading 5,000 troops stationed in the siege lines across the Ikutama Canal. 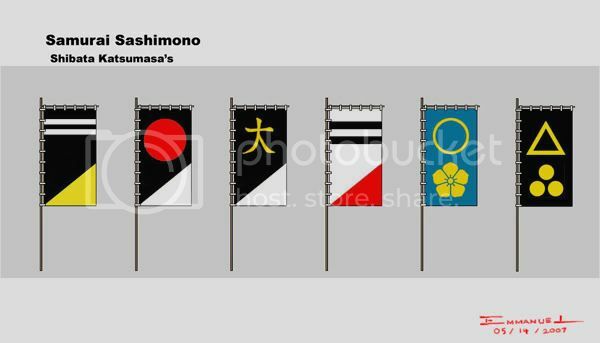 It appears that with the exception of the O uma-jirushi flag, Tadayoshi 'inherited' Kazutoyo's heraldry. The character in Kazutoyo's O uma-jirushi are written diffently in two different Rekishi Gunzo books (this is the version I liked more). Yamauchi heraldry appear in O uma-jirushi. 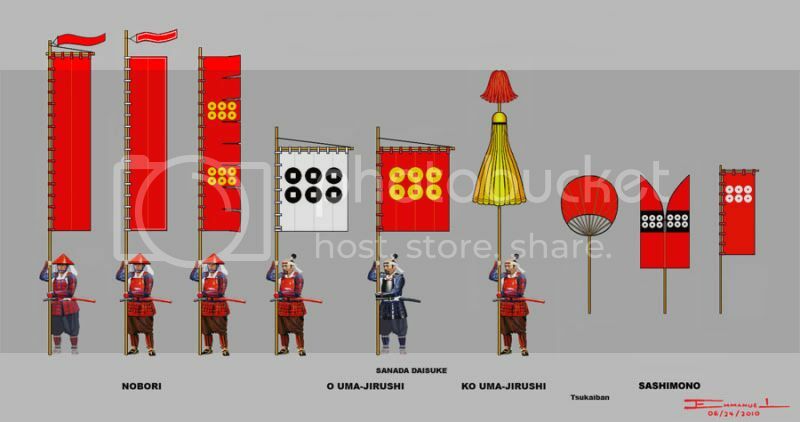 Turnbull described the 3d uma-jirushi as a white hat, but it appears as ochre(?) in O uma-jirushi. 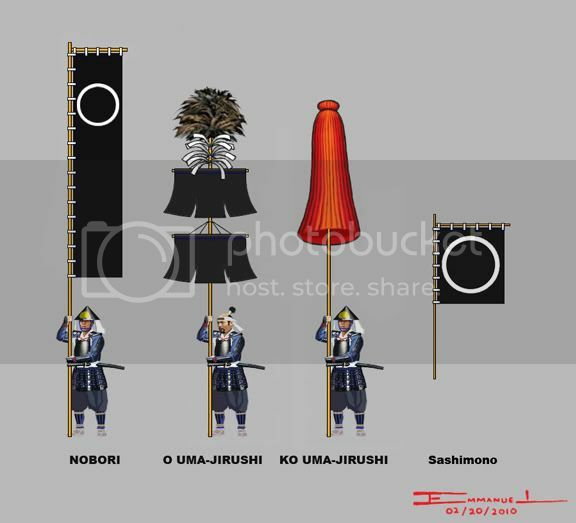 The 3d 'black wreath' samurai sashimono also appear in the Sekigahara screen showing Yamauchi troops outflanking the Western army. The wreath is not a full circle in the screen, but look more like a crescent moon in shape. 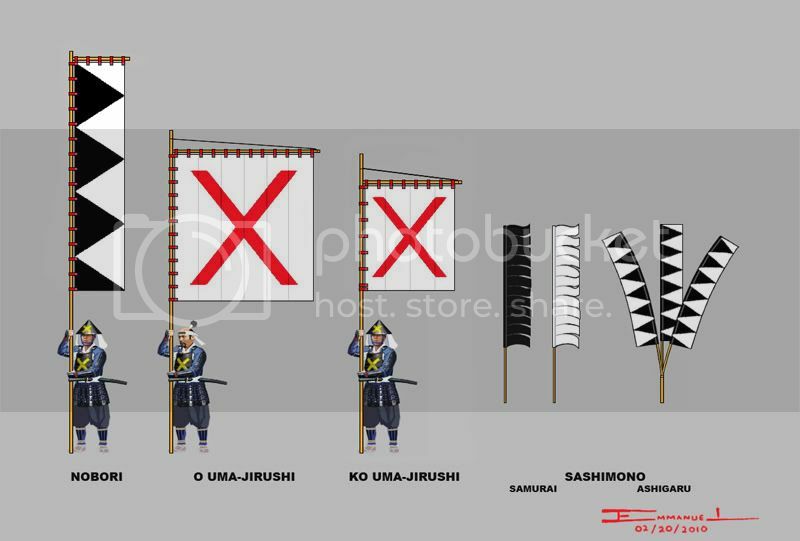 Other versions of the Sekigahara screens show the black flag sashimono. Kazutoyo's 'tree' sashimono looks like a tree in autumn, having lost most of it's 'leaves'. Compare it with Niwa Nagahide's tree, in full bloom in 'summer'. HORIO YOSHIHARU (1543-1611),One of Kazutoyo's comrades. He served Toyotomi Hideyoshi. Took part in the siege of Inabayama castle and led troops at Yamazaki. HORIO TADAUJI (1575-1604), Yoshiharu's son. He fought for Ieyasu at Sekigahara. Horio heraldry are included in O Uma-jirushi. 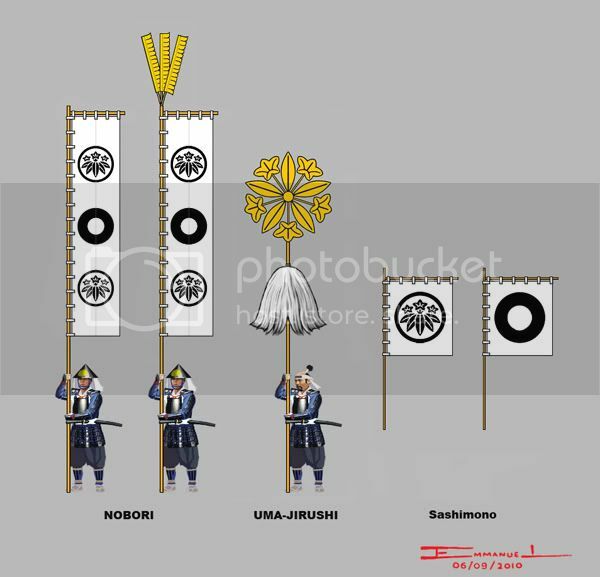 The Sourcebook mention a small white ashigaru sashimono which is not inlcuded in O Uma-jirushi. The II 'RED DEVILS'. Probably the most colorful contingent on the Sengoku period battlefield. The vanguard of Tokugawa Ieyasu's army. The first through the breach of the Hojo's Odawara castle 1590. At Sekigahara, they started the epic battle without orders and charged into the enemy ranks, denying the Fukushima their role of vanguard. At the siege of Osaka they suffered heavy casualties attacking the Sanada maru, ignoring orders to withdraw. II NAOMASA (1561-1602) 'LORD OF THE RED DEVILS', One of Ieyasu's bravest 'generals'. Very conspicious in heavy red armour, his helmet surmounted by huge golden horns, he appeared like a demon on the battlefield leading his troops into battle personally. He would pay for this at Sekigahara where he was seriously wounded by enemy snipers. 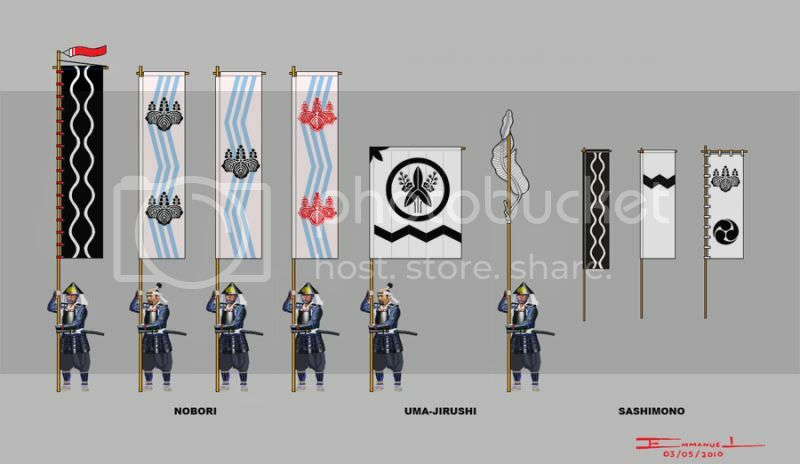 The white nobori and the O Uma-jirushi are illustrated in the Nagakute screen and may show the 'early banners' flown by Naomasa in the Red Devils' first battles. The rest are based on descriptions from the Iike Gunpo, a document that gives the full regulations and detailed appearance of the Ii army.. The light blue horo is based on Iike Gunpo description and on figures with 'light-colored' horo on the Sekigahara and Osaka screen. Surnames were written on gold on top of the horo for all Ii Tsukaiban. Even magnified the writings on top of the horo can not be seen clearly, so pardon the 'gibberish' in my horo sample. 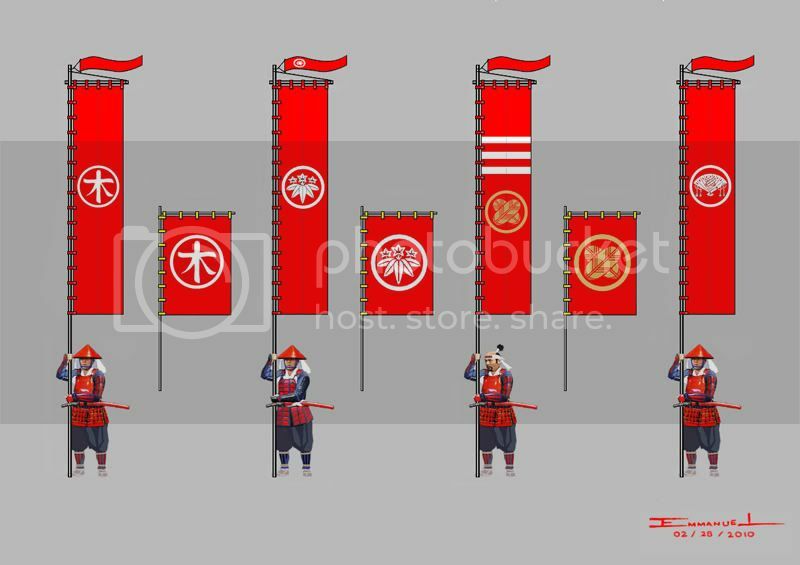 The all red banners illustrated above are from the Sekigahara screens, displayng the final look of Naomasa's heraldry. Most are based on photos of actual items that have survived. An 'enlargement' of the streamer with the characters Hachiman Dai Bosatsu at the top of the nobori is based on a very good photo. The same characters written in gold on a narrow red sashimono may have been worn by elite bodyguards. The Sekigahara screens show well-equipped teppo tai and yari ashigaru wearing these Hachiman sashimono. The 'individuality' of Ii samurai sashimono make the Red Devil army one of the hardest to illustrate accurately. Ii samurai by 'invitation' have their names written in gold on red sashimono. The difference in styles of writing may show that these individuals wrote them personally. Large numbers of these 'individual' sashimono are seen on the Sekigahara and Wakae screens. #1, 2, 3 and 5 were based on photos of the actual objects. #4 is an assumption of what the vanguard commander Kimata Morikatsu's sashimono might have looked like, based on the way his name was written on the plaque displayed with his armour. Sashimono #5 is the sashimono of Nakajima Yusen, the Nakajima one of the families serving the Ii. (Thank you to Gilles Caluwe for the photo of Yusen's sashimono, from his personal collection of actual Ii artifacts). II NAOTAKA (1590-1659) Second son of Ii Naomasa who took over command of the Red Devils for the Osaka campaign when his elder brother refused. At the battle of Wakae Ii Naotaka led the charge against the Osaka troops of Kimura Shigenari. Red Devil Ando Shigekatsu (1597-1623) would present the head of Kimura Shigenari to Ieyasu. Naotaka fought alongside Matsudaira Tadanao in attacking the Sanada Maru where they suffered heavy casualties. In the final Battle of Tennoji Naotaka directed Tokugawa artillery that set ablaze the keep of Osaka castle. 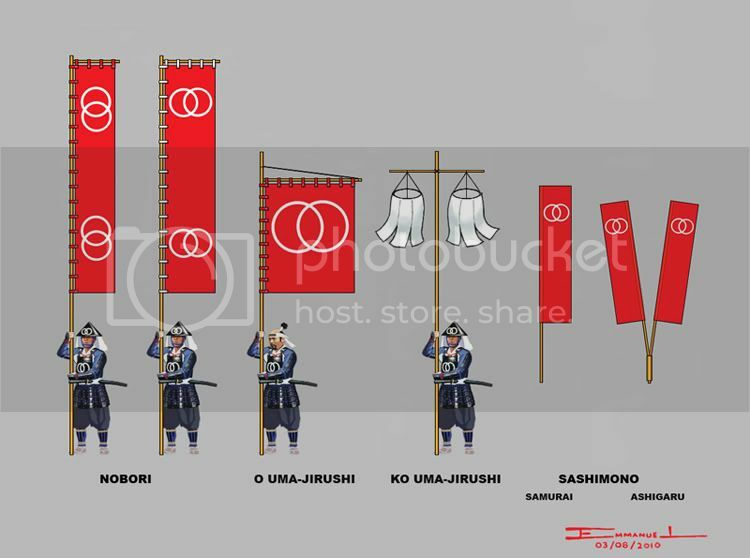 Naotaka's banners are based on O Uma-jirushi and on the Osaka screen depicting the Battle of Wakae. 'Individual' Ii sashimono seen in the Osaka screen show 'variety' mingling among the large numbers displaying names. All below are from the Osaka/Wakae screen. Retainers by 'invitation' can wear the mon of their commanders instead of the Ii mon. Much of the earlier illustrations I did of the Red Devils when I first started I have since learned to be wrong. This is what I currently know, and have yet to identify several more contingents within the Ii army. These are unidentified 'units' within the Ii army. All are from the Sekigahara screens. Nobori/sashimono #2 display the mon of the Ishikawa, one of the important families serving Ieyasu. Individuals from families serving Ieyasu may have served in the ranks of the Red Devils. Ando Shigenobu and his son Shigenaga served the Tokugawa. A certain Red Devil named Ando Shigekatsu gained fame at the Battle of Wakae. Suzuki Hyoe was a retainer of Ii Naomasa who was sent to assist Yamauchi Kazutoyo pacify Tosa province after Sekigahara. Nobori/sashimono #1 display the character ki. Would this be the Ii banner for Suzuki? Vanguard of the Ii Red Devil, KIMATA MORIKATSU. 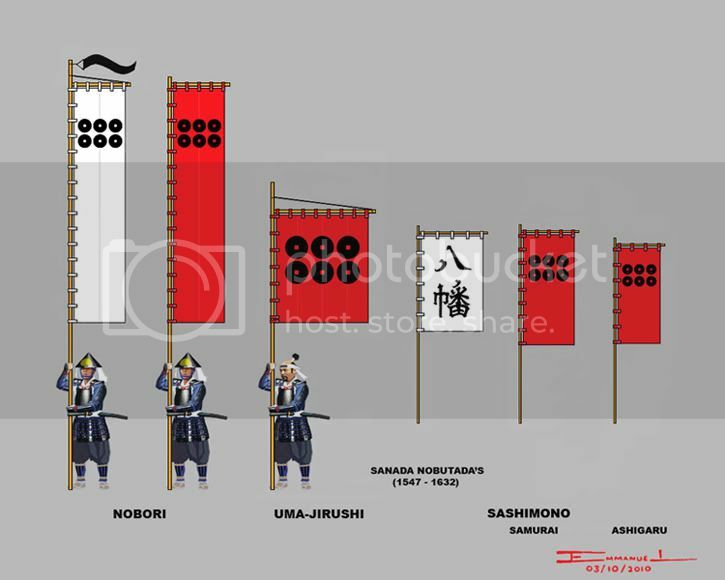 Based on the Sekigahara and Osaka screens, Morikatsu's troops appearing very prominently. Morikatsu's entire contingent was also illustrated in a Rekishi Gunzo book. The 'enlargement' of the nameplate for one of the Tsukaiban horo is based on a contemporary diagram of Ii equipment. My apologies if my interpretation looks 'gibberish'. The color of the mon displayed is a close approximation as they appeared on the screens. Rekishi Gunzo illustrated them as white on red. Two Tsukaiban are attached to the Kimata vanguard. One to relay orders within the unit. The second Tsukaiban to relay messages to the daimyo Ii Naomasa/Naotaka or to other Ii 'units'. 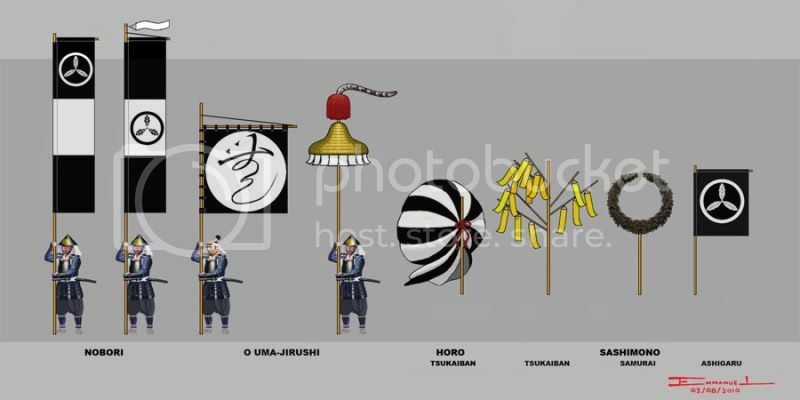 The Tsukaiban with the striking 'polka dot' horo will be immediately recognized by Naomasa/Naotaka and the other Ii units as coming from Kimata Morikatsu. Likewise Morikatsu will immediately recognize his daimyo's Tsukaiban displaying the light blue horo. KIMATA SASHIMONO, Kimata samurai, mounted and on foot wear sashimono with their names on them. 'Lower ranking' samurai wear sashimono with the triple tomoe Kimata mon. Ashigaru wear the smaller sashimono with the Kimata mon. The Sekigahara screens show the Kimata mon in 'copper' color. The Osaka/Wakae screen show the mon in white outline. Tip of the Spear, KIMATA MORIKATSU. Commander of the vanguard of the Ii Red Devils. He is illustrated mounted an a 'pony-sized' Kiso, the correct breed of horse ridden by samurai. Many thanks to Bill Dunkle ('Hachiya' from the old Samurai Forum) for the photo of Morikatsu's armour. The set did not include haidate. I added one to 'complete' the look of a fully-armoured Red Devil. Actual size detail. The pattern on his breastplate, of what looks like the outline of a warfan. The photo is not clear enough, so I can't tell if the pattern is 'painted' on, embossed, or an applique. The menpo with the set was a big help to hide the face, as I don't have a contemporary portrait of Morikatsu to draw on. Fantastic work evalerio. Love the Ii Red Devils stuff. Was the artwork done on Adobe Illustrator? Four weeks ago, I was still in the 'Stone Age' and had asked my brother whether he could scan some of my pen and ink drawings so I could post it here. Instead he gave me Photoshop and I'm hooked. Tokugawa Ieyasu's other 'color' contingent. DOI TOSHIKATSU (1573-1644) The son of Mizuno Nobumoto, Ieyasu's uncle who was executed when accused of treason by Oda Nobunaga. Doi Toshikatsu would command Ieyasu's 'Yellow Regiment', ki sonae, which may have been part of Tokugawa Hidetada's huge contingent during the Sekigahara and Osaka campaigns. Based on O Uma-jirushi. The size of the plumed ko uma-jirushi is speculative. 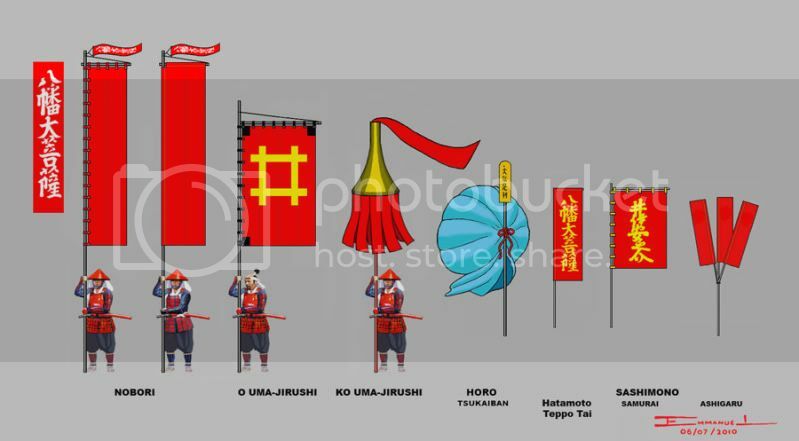 The banners of the Aka Oni Red Devils and the Ki Sonae Yellow Regiment are dazzling examples. There are rare examples of gruesome designs showing the gory nature of samurai warfare. The examples below, as far I know, identify individuals rather than a unit or contingent. And as disturbing as the designs are, they were meant as a tribute and to honor the dead. OCHIAI SAHEIJI - A retainer of Takeda Katsuyori. During the siege of Nagashino he was greatly moved by the bravery of Torii Sune'emon who succeeded in getting help for the defenders of Nagashino, but was crucified by the Takeda. Saheiji would later become a retainer of the Kishuu clan where he wore the sashimono of the crucified Torii Sune'emon in battle. The Uma-jirushi is often seen in samurai heraldry books, including photos of modern reproductions. Ritta Nakanishi illustrated Saheiji wearing the sashimono in his 2nd volume book of The History of Japanese Armor. MATSUNO HIROCHIKA - A retainer of the Date family. His banner bore the design of the decapitated head of a young warrior he killed in battle in 1615. Hirochika made the flag and prayed for the dead man's entry into paradise. 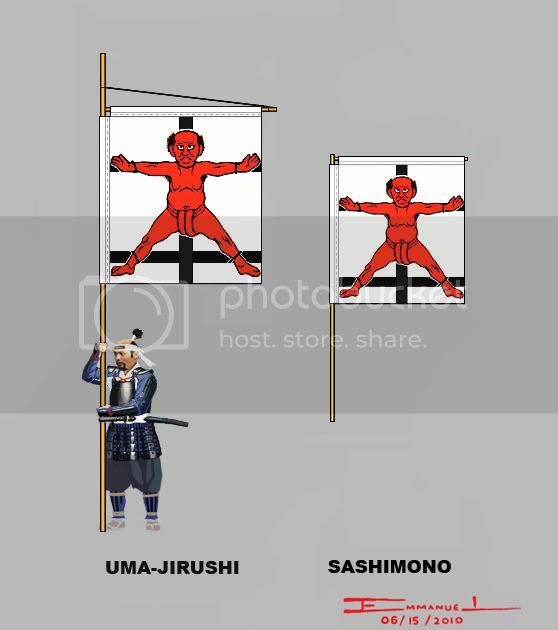 The sashimono is from Turnbull's 'Samurai Warriors', the uma-jirushi is from The Sourcebook. sounds great! Keep up the good work. The SAKAI of Mikawa. One of the chief retainer families of Tokugawa Ieyasu. 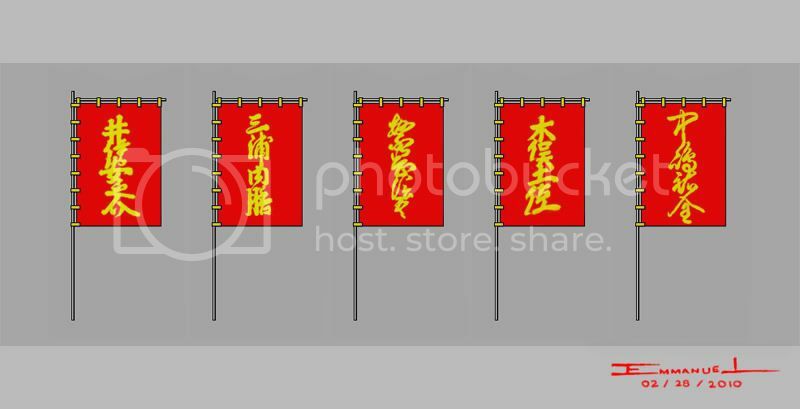 An example where different branches of one family used different symbols on their flags. SAKAI TADATSUGU (1527-1596), One of Tokugawa Ieyasu's finest commanders. At Mikata ga Hara he held the extreme right flank where he was cut off and surrounded when the Oda allied troops on the right wing were swept off the battlefield by the Takeda. He fought his way out of the encirclement to rejoin Ieyasu. 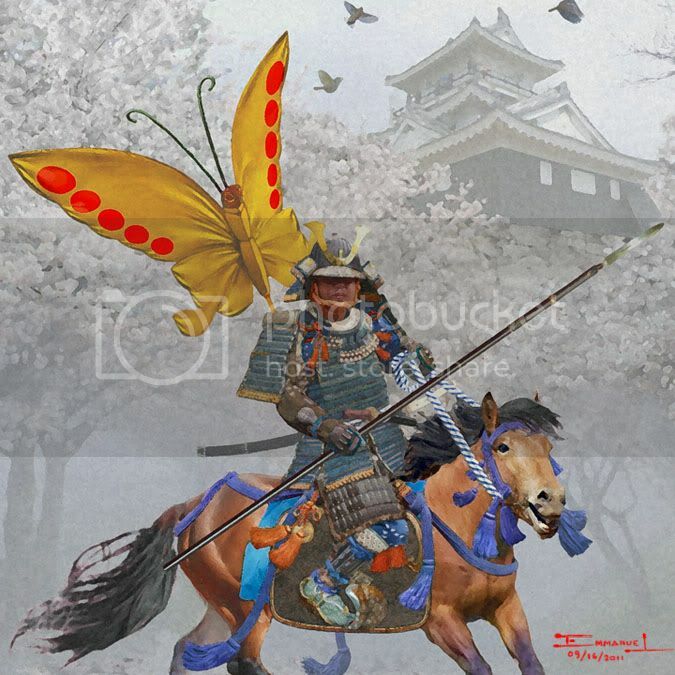 Reaching the safety of Hamamatsu Castle, he beat the drum on the watchtower to guide the scattered Tokugawa troops home. At Nagashino he led troops out of the safety of the palisades to raid the Takeda camp. SAKAI IETSUGU (1564-1619), Tadatsugu's son and heir. Ietsugu would lead the Sakai troops at the Battle of Sekigahara and during the Osaka campaign. He 'inherited' his father's banners. 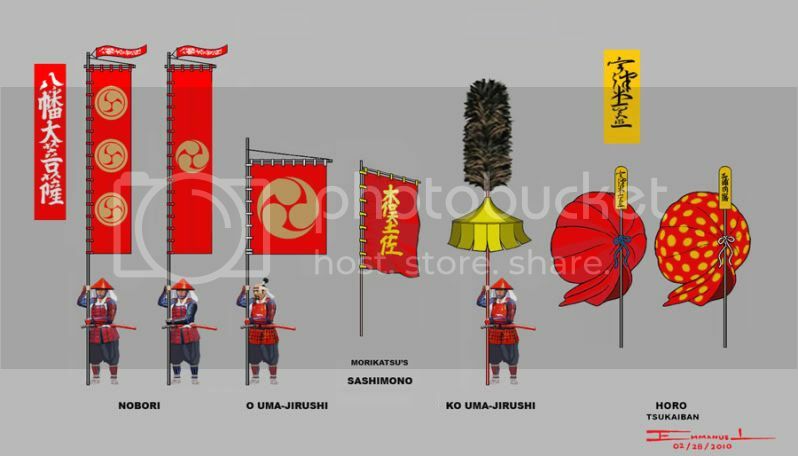 The banners are based on O uma jirushi and on clear interpretations on Rekishi Gunzo books. Tsukaiban sashimono are described as red disc on green on Turnbull's Sourcebook. O uma jirushi show a gold disc on green. 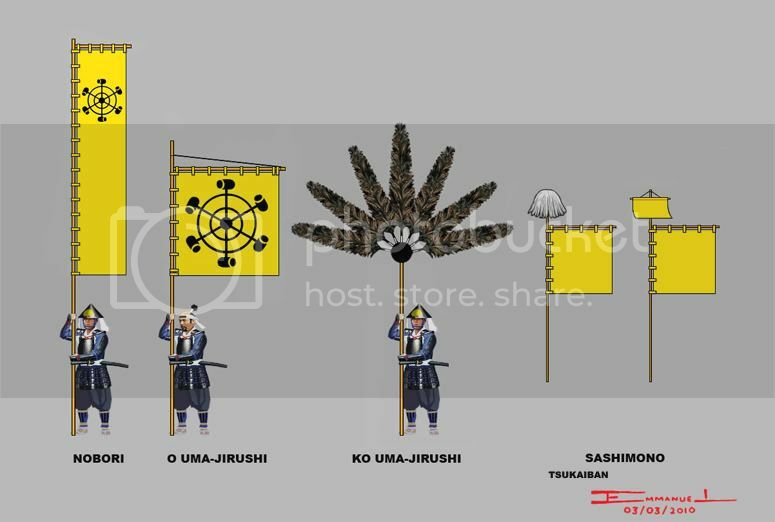 Tadatsugu's banners look very 'modern', used by Japan today. Tadatsugu's personal sashimono is based on a crude painting in the Osprey Nagashino book. 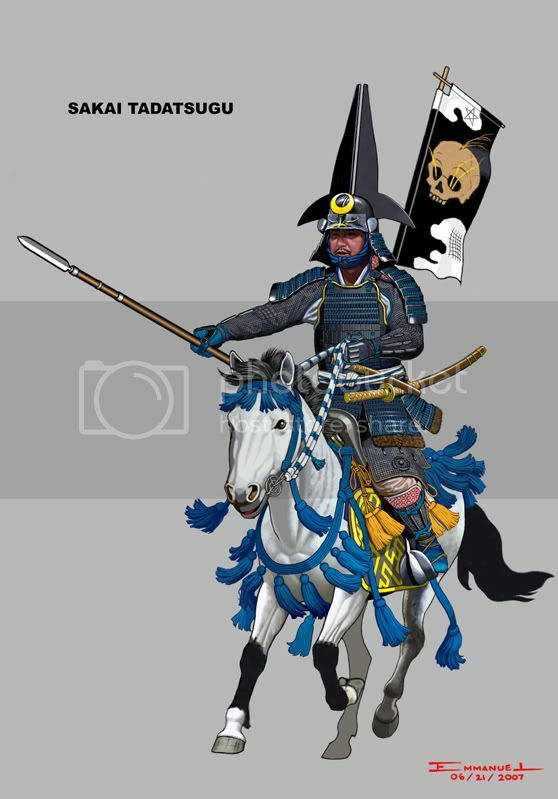 I would be grateful if anyone can provide a better photo of the sashimono which is said to be displayed in the Nagashino Battlefield museum in Shinshiro. SAKAI TADATSUGU. One of my favorite subjects to draw. His exploits at Mikatagahara and Nagashino, his different sets of armour that were different from one another, make him a source of many drawings in my sketchbook. I drew him based on Turnbull's description on how he may have looked at the Battle of Nagashino. 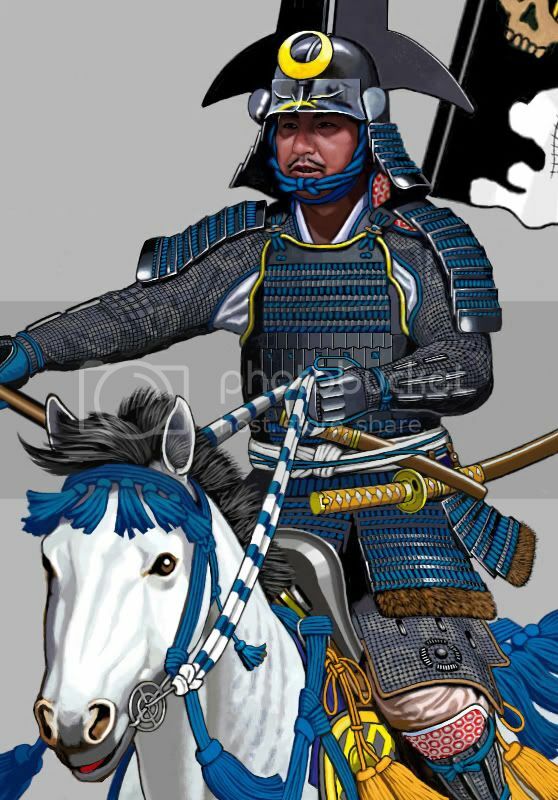 The color plate in Turnbull's Nagashino book is crude where Tadatsugu is illustrated wearing a 'puny' helmet. Thanks to Bill Dunkle (Hachiya) for the photo of Tadatsugu's actual armour, where the helmet crest is more impressive than it appeared in the Osprey book. Actual size detail. This armour comes complete with menpo, but I decided not to use it so I could draw the face. I have a good contemporary portrait of Tadatsugu, and I wanted to try my first portrait with a stylus. The face is my interpretation of what the Japanese artist saw when he drew Sakai Tadatsugu. Note the fur at the lowest part of the Kusazuri. The 'net' on the haidate and kote are a 'compromise' due to the limitations of the medium to depict mail while showing the brocade in the fabric underneath. While Ieyasu's other famous commanders like Honda Tadakatsu and Ii Naomasa were almost always associated with a particular set of armour, Tadatsugu had at least three different and distinct sets. This one is my favorite. HONDA YASUTOSHI (1570-1622), Second son of Sakai Tadatsugu. Adopted by Honda Tadatsugu. Fought in the Battle of Sekigahara and in the Osaka Winter campaign where he was positioned in the center of the siege lines to the east of Osaka castle. Based on O Uma-jirushi. The white streamer on top of the nobori display the Honda mon. Unique in having a fukinuki as a standard and the commander's personal sashimono. 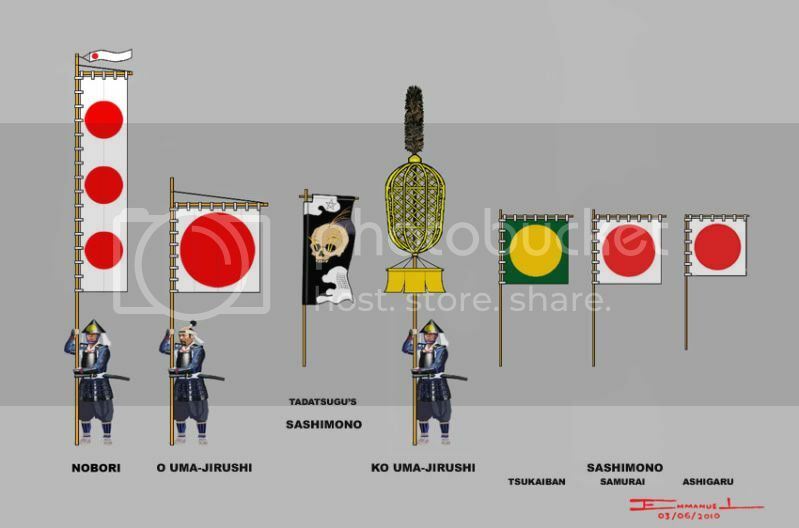 Tsukaiban and samurai sashimono are shown as identical with only the flag attachments being of different color. While the 'senior' branch under Tadatsugu used the red rising sun, the other branch used the Sakai wood sorrel mon. Based on O uma jirushi. During the Sekigahara campaign this branch stayed behind to guard Edo while the other senior branch led by Ietsugu fought at Sekigahara. I know very little of the junior branch of the Sakai. Based on O uma jirushi. The ashigaru sashimono has small black Sakai mon on red. Please share every other work you make. Too good to not be on my HD too. The 'SEVEN SPEARS OF SHIZUGATAKE'. At the battle of Shizugatake 1583 seven samurai serving Toyotomi Hideyoshi earned great honour and became known as the shichi hon-yari, the 'Seven Spears of Shizugatake'. 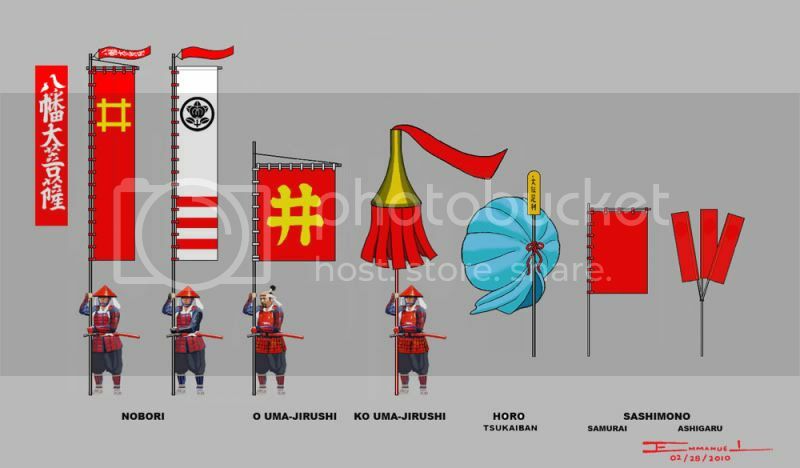 NOTE: The heraldry sets below would not have been in existence yet when these men fought in Shizugatake. They would come later as they rise in rank in Hideyoshi's army. FUKUSHIMA MASANORI (1561-1624) One of the 'Seven Spears'. At Shizugatake he engaged a prominent samurai named Haigo Gozaemon and ran him through with a spear. He would lead 4,800 men in the Korean invasion. He would command the vanguard of the Eastern army at Sekigahara. Based on a complete set in a color plate in Rekishi Gunzo's '118 Famous Daimyo'. 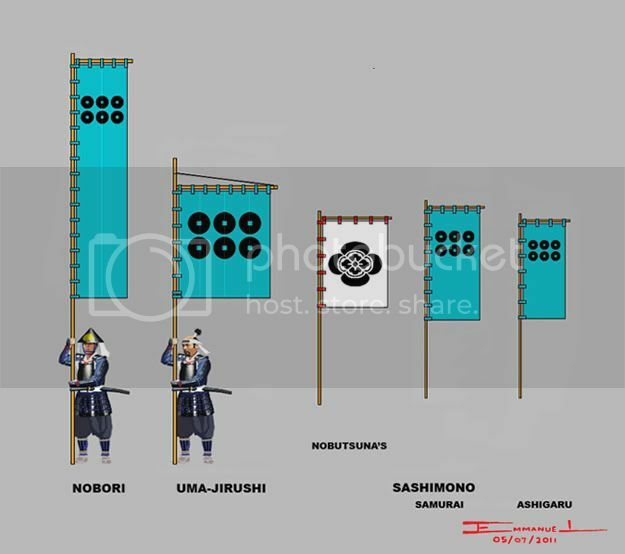 With the exception of the black nobori, all the white banners above appear in the Sekigahara screens. In the screen, the white sashimono with black zigzag lines is worn by a single mounted samurai near the Uma-jirushi, a possible Tsukaiban (?). 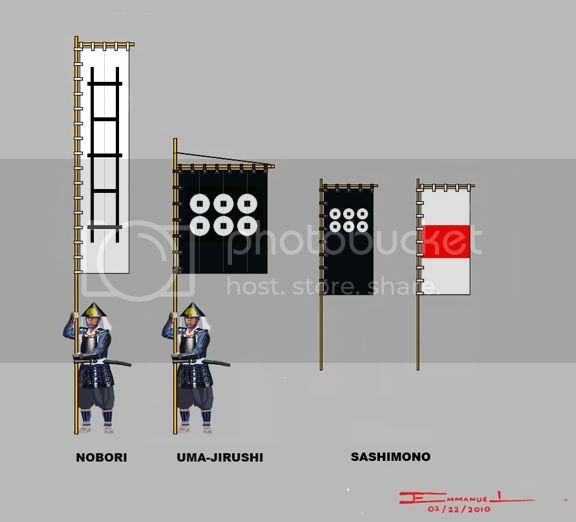 The three nobori with paulownia mon are held by ashigaru, supporting a dismounted samurai engaged in hand-to-hand combat. The black nobori appear by itself in other screens. 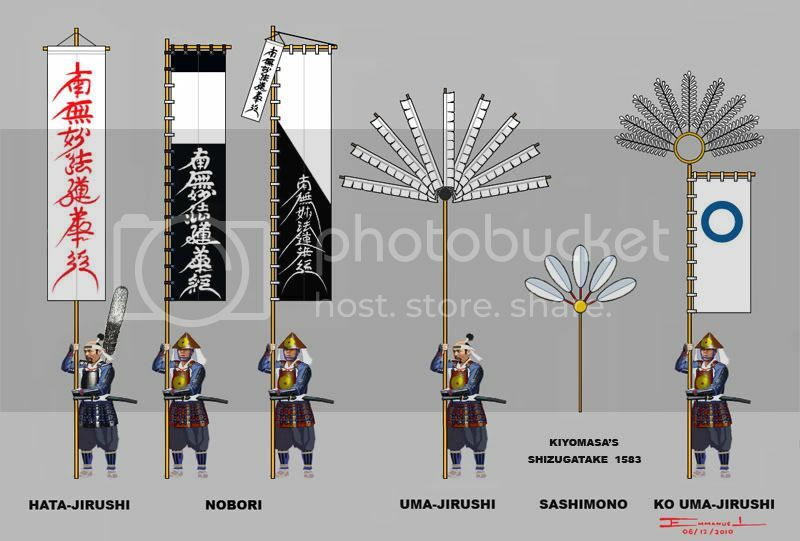 It appears in today's reenactments of the battle of Sekigahara, where smaller versions of the black nobori are worn as sashimono. WAKIZAKA YASUHARU (1554-1626), served Akechi Mitsuhide at Yamazaki, but then joined Toyotomi Hideyoshi and fought for him at Shizugatake where he was named one of the 'Seven Spears'. He became a naval commander and served in Hideyoshi's invasion of Kyushu, the siege of Odawara and the invasion of Korea. He was defeated in the naval battle of Hasendo by Admiral Yi Soon Shi. At Sekigahara Yasuhara led 1000 men for Ishida Mitsunari, but switched sides and joined Kobayakawa Hideaki in attacking the Western Army. In the Korean TV series "The Immortal Yi Soon Shin" Wakizaka Yasuharu is the 'villain' and arch nemesis of the Korean hero Admiral Yi. A complete set is in O uma jirushi. A drawing of the set appears in Osprey's 'Samurai Heraldry' and appears in the lower left of the Sekigahara screen. 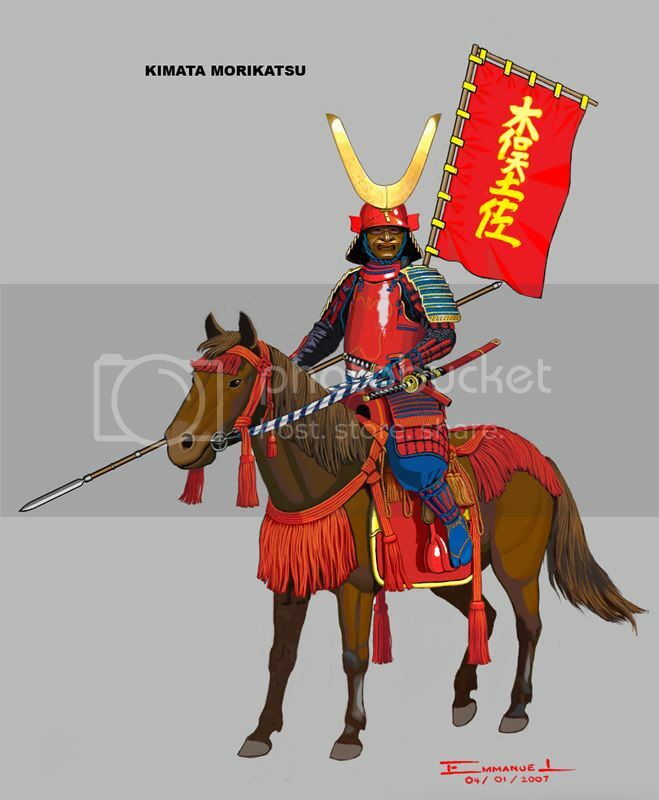 NOTE: Wakizaka standard bearers are illustrated with armour displaying Wakizaka mon. These are based on surviving example. KATO YOSHIAKI (1563-1631) - Another of Hideyoshi's 'Seven Spears'. He would become one of Hideyoshi's naval commanders, in the Kyushu and Odawara campaigns, and during the invasion of Korea. Like Wakizaka Yasuharu, he would lose battles with the Korean navy. At Sekigahara he was part of Tokugawa Ieyasu's vanguard. Yoshiaki's banners appear in color plates in two Rekishi Gunzo books. The character ju on his nobori. 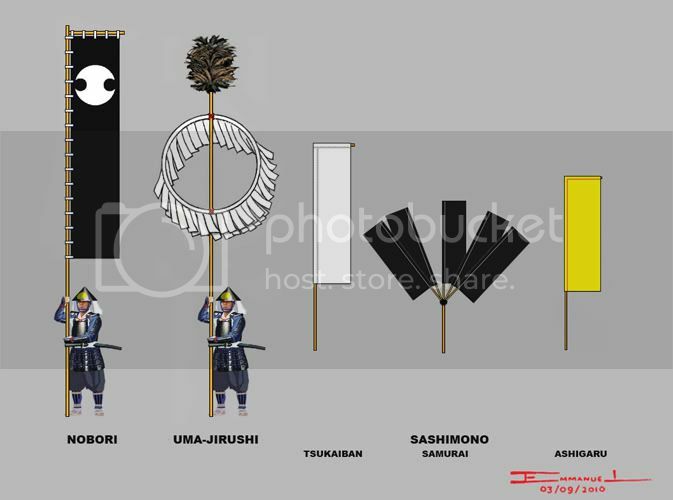 Turnbull in The Sourcebook described both the tsukaiban and samurai sashimono as black serrated flags. 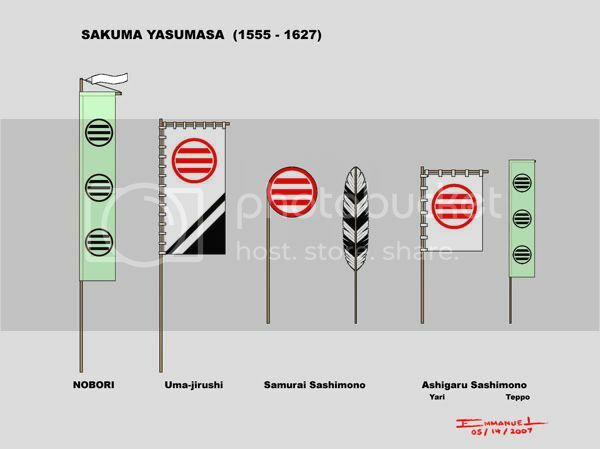 In O uma-jirushi two serrated flags are shown, one black and one white..
Kato Yoshiaki's banners may have been plain and simple, but he has at least two sets of impressive armour and helmet, including one grotesque-looking one. I haven't found sashimono for ashigaru, but example of Kato Yoshiaki ashigaru armour show a brown-lacquered hotoke-do with a very large gold disc on the breastplate. KATAGIRI KATSUMOTO (1556?-1615) - Distinguished himself as one of the Seven Spears of Shizugatake. Participated in the Kyushu campaign. Remained neutral during the Sekigahara campaign. Though his troops fought for Tokugawa Ieyasu during the sieges of Osaka, he tried to negotiate peace between Ieyasu and Toyotomi Hideyori. He committed suicide after Osaka fell. KATAGIRI TAKATOSHI - Katsumoto's son, inherited the black and white nobori, the uma-jirushi and the gourd sashimono which appear in O Uma-jirushi. Color plates in Turnbull's books show purple and white nobori. Samurai reenactors participating in festivals wear purple and white sashimono. Katsumoto's personal sashimono appear in the Shizugatake screen. KATO KIYOMASA (1562-1611) - One of the Seven Spears of Shizugatake and Hideyoshi's most fearsome commander. He took part in the Kyushu campaign and with Konishi Yukinaga, led the invasion of Korea. The only Japanese commander to cross into China then withdraw. In the epic siege of Ulsan, he led the determined defense against enormous odds. 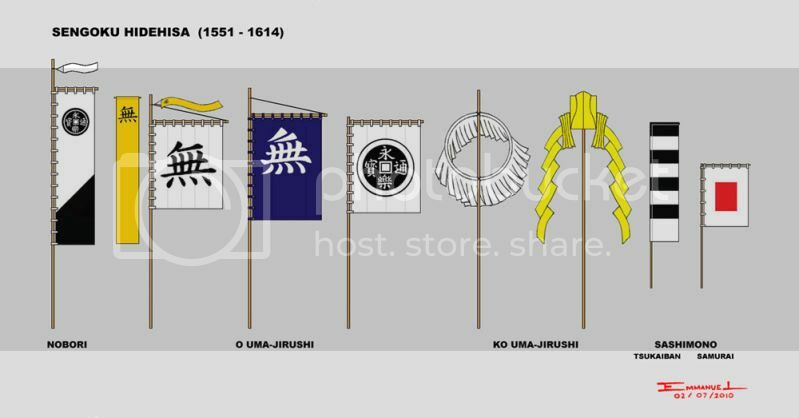 Kiyomasa's banners appear often in heraldry books, the main banners recorded in O Uma-jirushi. His personal sashimono appears in the Shizugatake screen. His famous Nichiren hata-jirushi bearing Buddhist inscriptions was thrown by the standard-bearer over the breach in the walls of Chinju, Kiyomasa determined to be the first to enter the besieged city. The ko uma-jirushi is based on a woodblock print and an Osprey book color plate, it's dimension is speculative and made to appear 'lesser' in size than the 'greater' standard. NOTE: The ashigaru standard bearers have been redrawn with new armour, based on surviving example. KATO SASHIMONO - There were varied types of Kato sashimono. His three most loyal retainers wore plumed feather sashimono and took turns as standard bearers for his Nichiren Hata-jirushi. Iida Kakubei gained fame for throwing the hata-jirushi over the walls of Chinju. 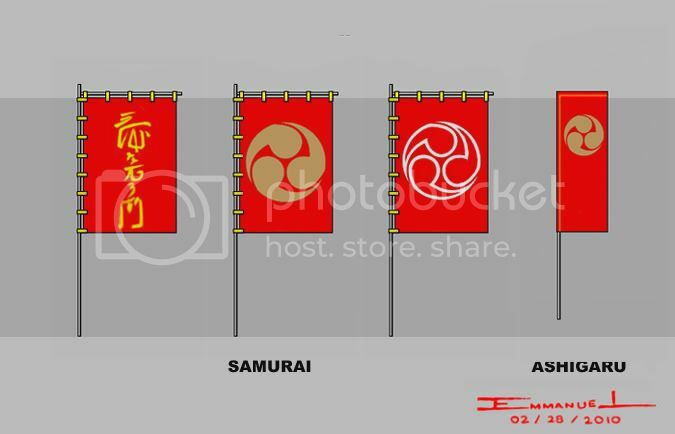 Kiyomasa's banners are some of my favorites. The Buddhist inscriptions written in different styles some of the most difficult to illustrate. 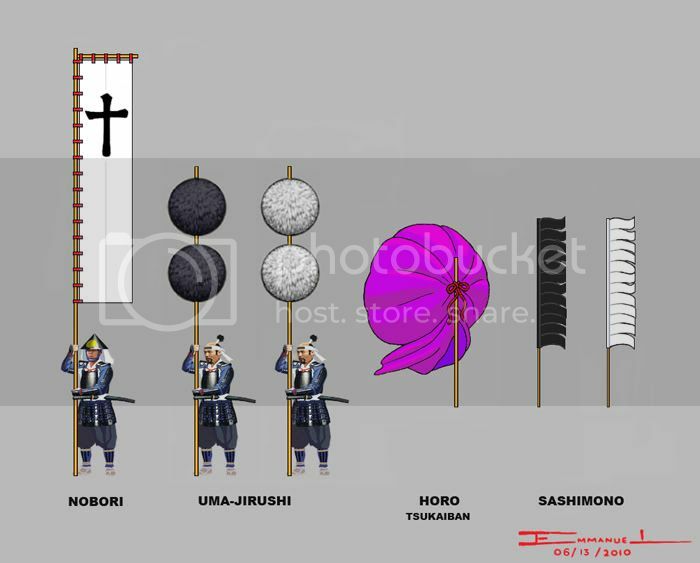 I find Kiyomasa's banners as 'works of art', elegant and beautiful to look at, in sharp contrast to the owner's ruthless reputation. Question regarding the date of his death. Samurai Archives Biographical Dictionary has it 1614, Turnbull has it at 1624. The SBD is a typo (a pain to correct with regular HTML pages - I'll have to get around to it though). And the sengoku jinmei jiten (戦国人名辞典) also has 1624, so I'm pretty sure that is right. This is a 'work in progress' in my sketchbook. 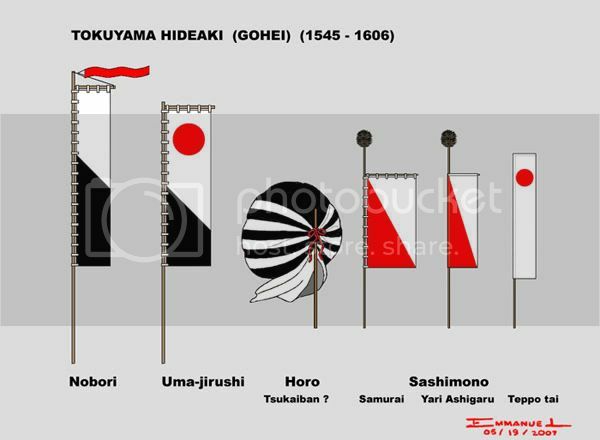 While Oda Nobunaga or Tokugawa Ieyasu are well illustrated with armour and heraldry, many others are a 'blank space' for me. Those defeated or destroyed on the battlefield often live little or nothing behind. For a long time I've had no 'visual' reference to Shibata Katsuie's army. For now, this is what I have of him and the men who fought for him at the battle of Shizugatake. The nobori and uma-jirushi are from various Rekishi Gunzo color plates and described in The Sourcebook. The sashimono are based on several of the Shizugatake screens. There is no 'uniformity' in the way the Shibata sashimono are depicted in the screens. If correct, their 'individuality' would be hard to describe. Shibata Katsumasa, adopted by Katsuie. Killed at Shizugatake. 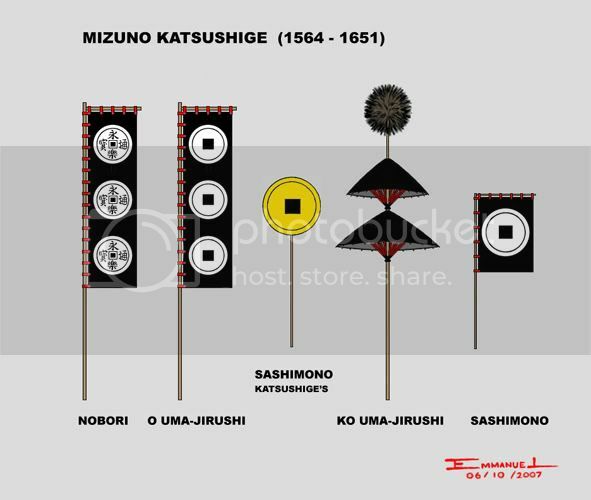 Rekishi Gunzo color plate of nobori helped locate Katsumasa's contingent in all of the Shizugatake screens. The uma-jirushi banner with Shibata mon appears in only one screen, but seemed a perfect design for Katsuie's adopted son. The 3d uma-jirushi 'trident' appears in three different screens. There is a bewildering array of ashigaru sashimono, and even more confusing 'individuality' in samurai sashimono. I've chosen those that appear the same in two of the screens. Sakuma Morimasa, Katsumasa's brother. 'Responsible' for the disaster at Shizugatake and later executed. 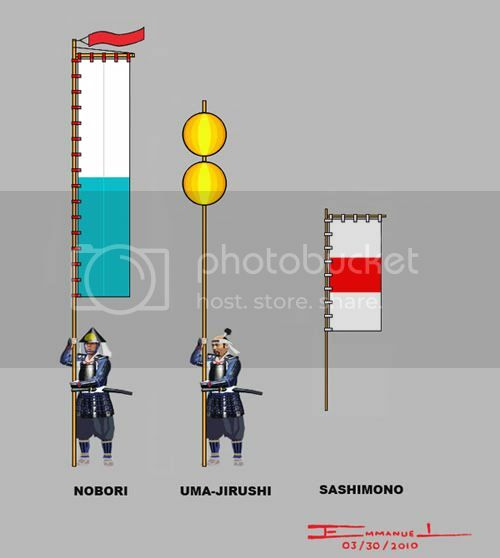 Nobori described in The Sourcebook and shown in Rekishi Gunzo color plate, helped locate Morimasa's contingent in all the screens. 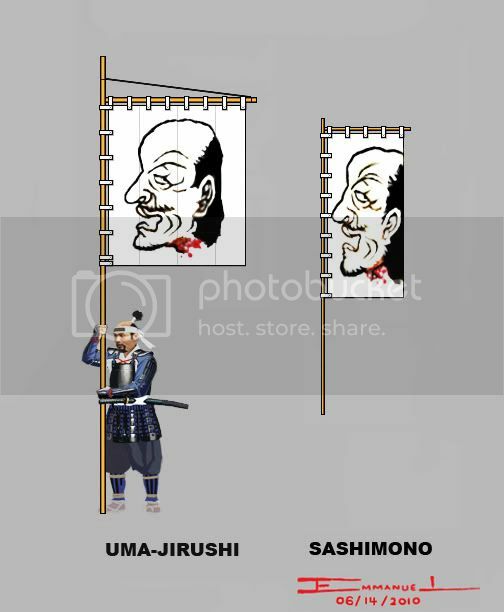 The 3d uma-jirushi, horo and ashigaru sashimono appear the same in all the screens. Contingent illustrated attacking Takayama Ukon in Iwasaki-yama. Sakuma Yasumasa (Thanks, Kitsuno). Katsumasa and Morimasa's brother. Survived Shizugatake. Rekishi Gunzo color plate of nobori helped locate this contingent in all the screens. A very large contingent with what appears to be several different 'divisions' of samurai with distinct but 'uniformed' sashimono. The survival of this contingent may explain the clear depiction of units of samurai and ashigaru. Always illustrated attacking Shizugatake and its doomed commander, Nakagawa Kiyohide. The 'Tokuyama Gohei tai' (Thanks, Kitsuno and Tony). Having survived Shizugatake, this contingent is also clearly depicted with 'uniformed' sashimono. Shown with Sakuma Morimasa's contingent, making frontal assaults on Takayama Ukon's troops in Iwasaki-yama. The Fuwa Katsumitsu tai (Thanks, Tony). Sourcebook description of nobori and uma-jirushi identify this contingent in the screens, it appears withdrawing from the battlefield as it is being attacked by Hideyoshi's arriving troops. 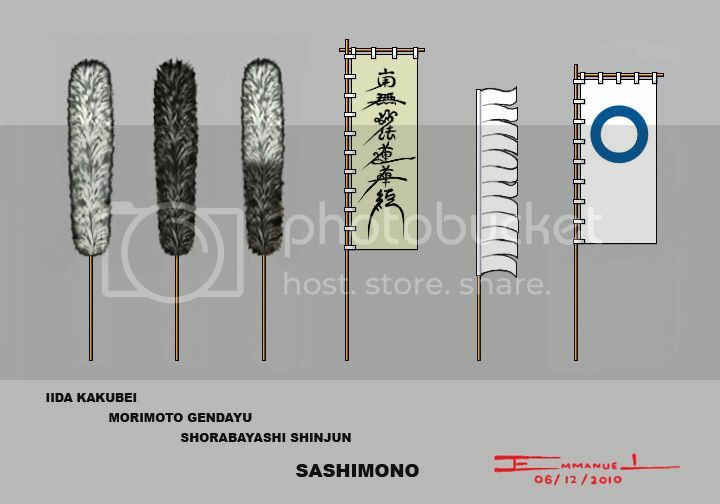 These are again 'works in progress', the banners with small case letterings are based on my own current interpretations of 5 Shizugatake screens. This thread seems to me good enought to be a sticky. The SANADA of Shinano. Served Takeda Shingen and fought against Uesugi Kenshin. Sanada armies were cut down in the futile charge against Oda Nobunaga at Nagashino. Defeated and defied Tokugawa Ieyasu more than once. 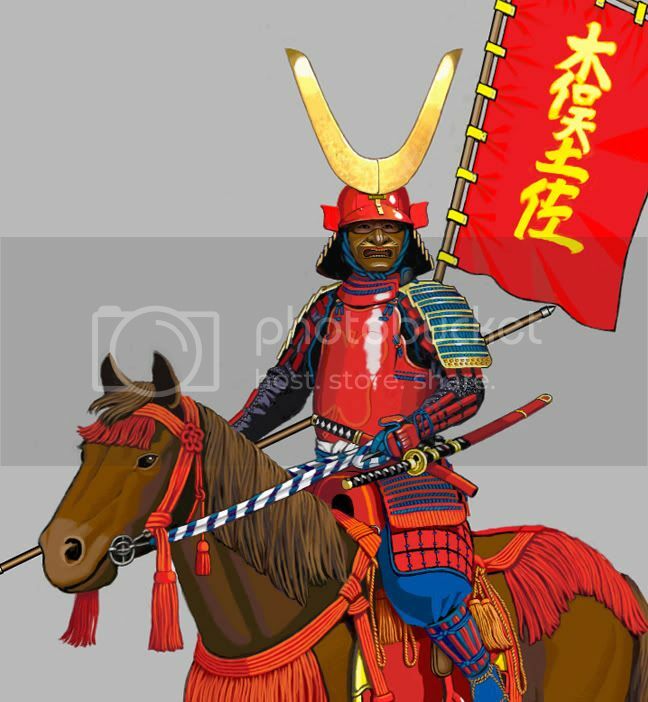 Sanada armies would fight in both sides at Sekigahara and in the sieges of Osaka castle. SANADA YUKITAKA (1512-1574), one of Takeda Shingen's 24 generals. 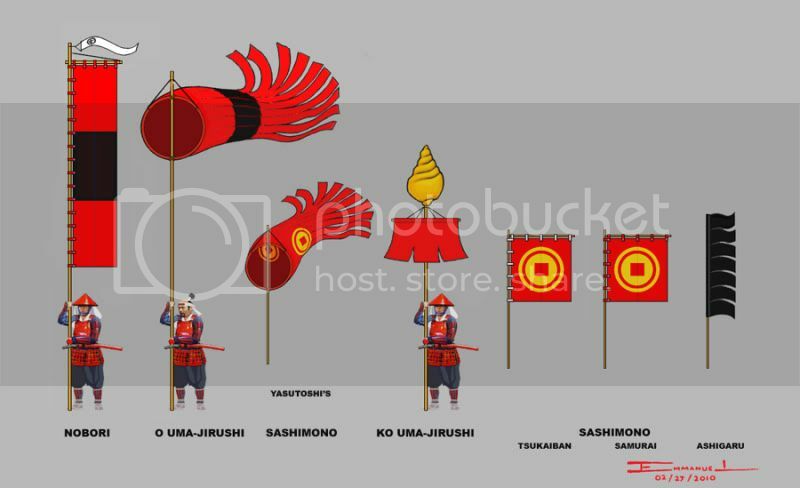 The red flags are based on those flown by the Takeda warband in the annual Kawanakajima festivals. The white nobori is based on the Kawanakajima screens. Nobutada's sashimono, presented to him by Takeda Shingen, is based on a photo in a Rekishi Gunzo book and it is illustrated in Turnbull's Samurai Heraldry book. SANADA NOBUTSUNA (1537-1575), Son of Sanada Yukitaka who was also one of Shingen's 24 Generals. 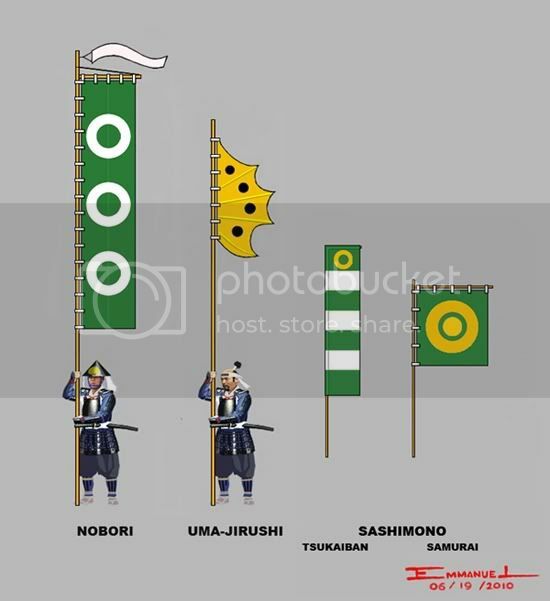 The green flags are based on those used by the Takeda warband in the annual Kawanakajima Festivals. Nobutsuna's personal sashimono appear in the Kawanakajima and Nagashino screens. 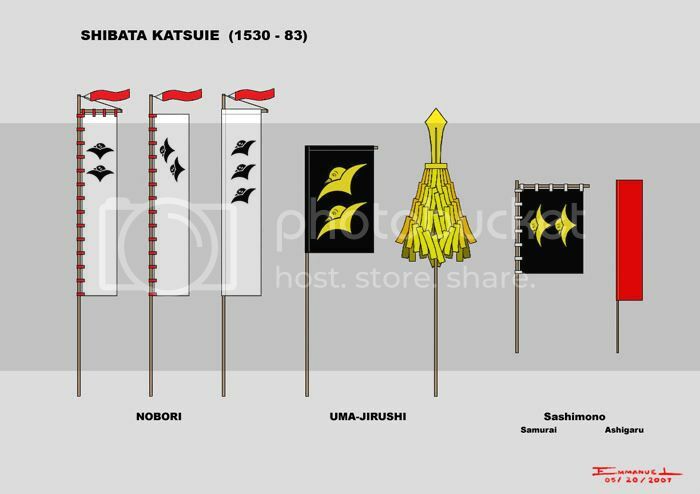 Sanada Nobutsuna's banners may have changed when he succeeded as the head of the Sanada with the death of Yukitaka. 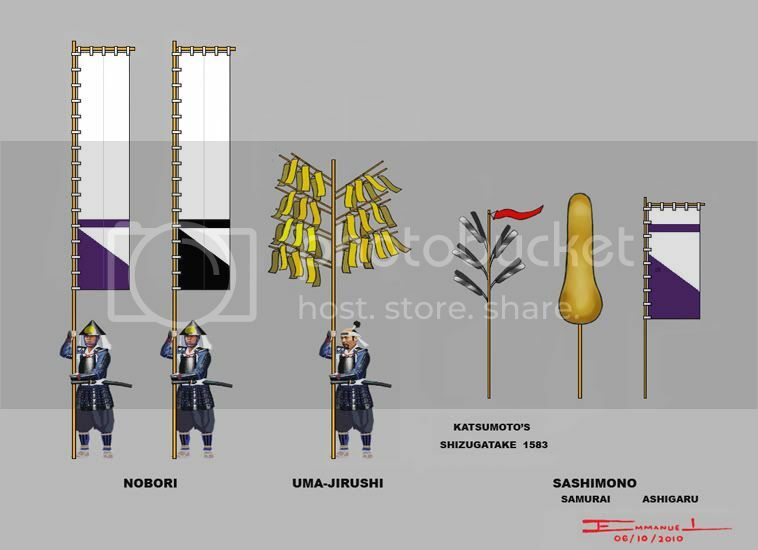 Below are his banners depicted in the Nagashino screen. Nobutsuna was killed at the Battle of Nagashino. The new banners above from the Nagashino screen, show where Nobutsuna falls in front of the palisades. The white sashimono are from the annual Kawanakajima festivals. SANADA MASATERU (1541-1575), Nobutsuna's brother. He was killed at the Battle of Nagashino. Masateru's flags are based on the Nagashino screen, showing him falling in battle with his brother. 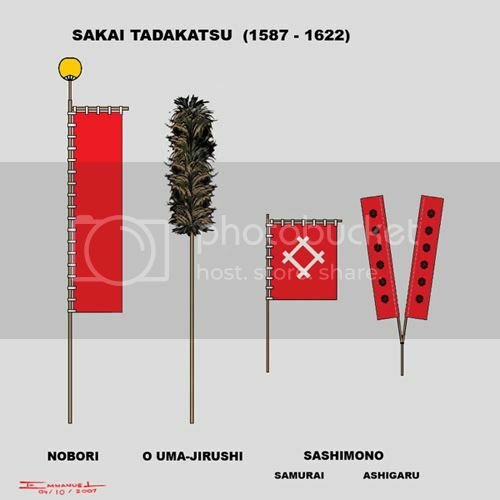 The red and white sashimono show the colors the Sanada used before they joined the Takeda. The Sanada would return to these colors after the demise of the Takeda. SANADA MASAYUKI (1547-1611), Nobutsuna's brother who would succeed the Sanada House after the disaster at Nagashino. He would defy Tokugawa Hidetada laying siege to Ueda Castle during the Sekigahara Campaign. 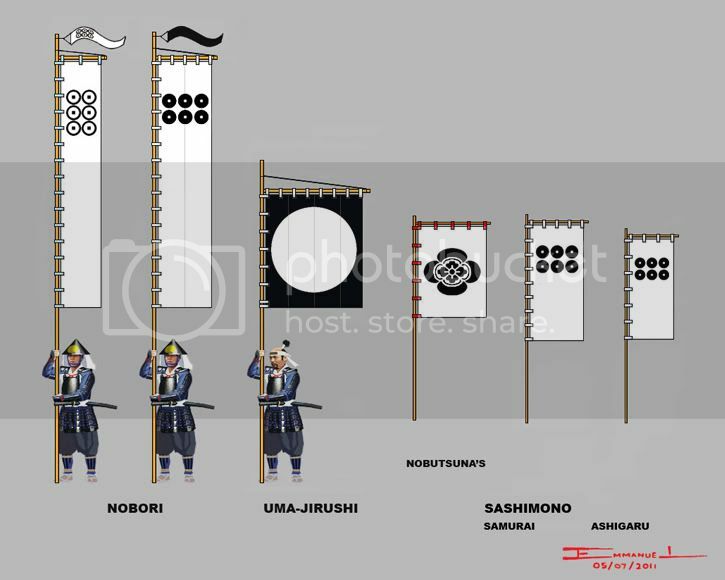 Masayuki's flags are based on the Kawanakajima screens. SANADA NOBUYUKI (1566-1658) - Masayuki's son. Took part in the defense of Ueda castle against Tokugawa Ieyasu. Sided with Ieyasu during the Sekigahara campaign. He sent his two sons to represent the clan and join Ieyasu in the sieges of Osaka castle. Based on O Uma-jirushi. The red fukinuki appears on the folding screen, but missing in the woodblock scroll. SANADA NOBUYOSHI (1593-1634) - Nobuyuki's son, led the Sanada contingent at the Battle of Tennoji, part of the Tokugawa vanguard. At Tennoji the Sanada advanced with the Tokugawa vanguard against the Osaka forces led by Sanada Yukimura. SANADA NOBUSHIGE (YUKIMURA) (1567-1615) - Second son of Masayuki and Nobuyuki's older brother. Took part in the succesful defense of Ueda castle against Tokugawa Hidetada during the Sekigahara campaign. In the final battles of samurai armies at the sieges of Osaka, Yukimura as the commander of Osaka troops gained everlasting fame. 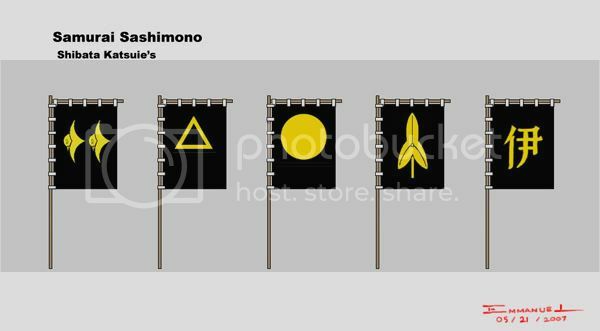 The main banners based on Turnbull's description on The Sourcebook and in two Rekishi Gunzo heraldry books. 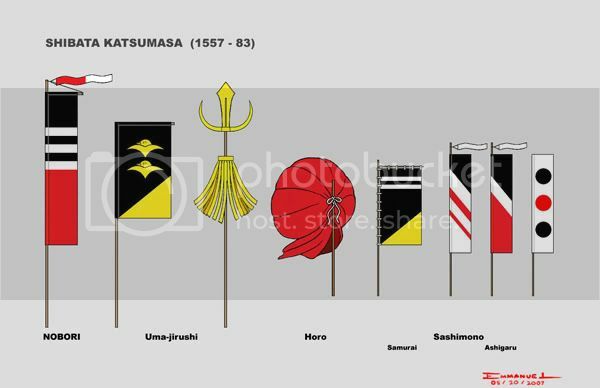 Daisuke's uma-jirushi in a color plate in Turnbull's Osaka book and the sashimono in 'Samurai Heraldry'. Two of Hideyoshi's less effective commanders that used the zen coin motif. Sengoku Hidehisa, what an appropriate name for the period! Defeated by Chosokabe Motochika at Hikita and the by the Shimazu at Hetsugigawa. UPDATED - 02/07/2010: Ko Uma-jirushi. Based on Turnbull's desciption in The Sourcebook and a Rekishi Gunzo color plate. The 'mu' banner in a color plate in Turnbull's 'Samurai Warfare'. The complete set appears in 'O Uma-jirushi'. I have photos of Sengoku Hidehisa's beautiful set of armour, as well as two types of colorful Sengoku ashigaru armour clearly identifiable with 'mu' or Hidehisa's mon, possible reasons sashimono may have not been used. Color plate of Hidehisa's ashigaru archer is currently in the works. Mizuno Katsushige, served under Sasa Narimasa in the Kyushu Campaign. He participated in the Korean campaign, serving under both Kato Kiyomasa and Konishi Yukinaga. Served the Tokugawa at the Osaka campaign and the Shimabarra Rebellion. Based on The Sourcebook, the complete set illustrated in 'O uma-jirushi'. One of the rare examples of a nobori-type banner used as an uma-jirushi. I am very impressed with the level of scholarship on this forum. 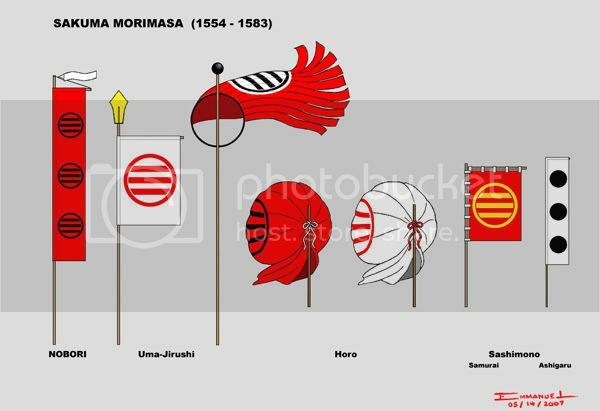 many fine historians filling the gaps in understanding samurai heraldry, and for this reason i've joined this group. 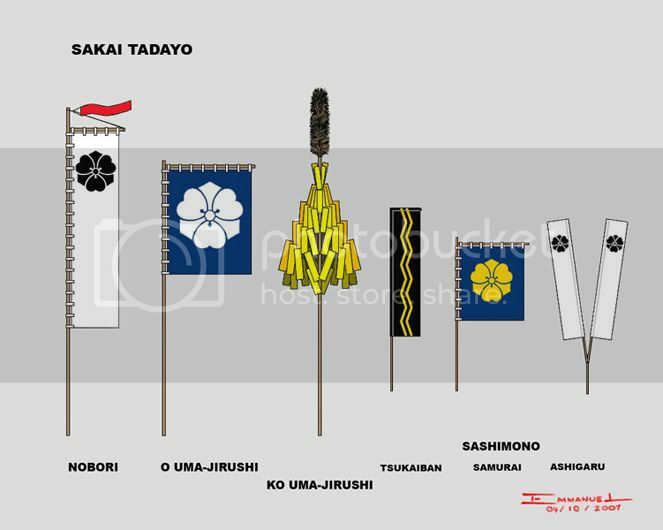 i have been doing research into a number of crests and flag indentifications using mainly books by stephen turnbull, websites and the few byobu folding screens pictures found online. with these sources i still find contradictions and mistakes which quickly lead to confusion. everyones expertise will be appreciated. Some of Tokugawa Ieyasu's noteworthy commanders. OKUBO TADAYO (1531-93) - An advisor to Tokugawa Ieyasu, he was part of the Tokugawa vanguard mauled by the Takeda at the Battle of Mikatagahara and entrusted with Ieyasu's Golden Fan standard to rally the collapsing Tokugawa army. Led the volunteers in the night battle of Saigadake. In the Anegawa screen Tadayo and Okubo samurai are depicted protecting Ieyasu's headquarters where Ieyasu was directly threatened by Asakura samurai, and where Tadayo's son Tadachika is depicted in the thick of the fighting. Again among the Tokugawa hatamoto at Nagashino where he faced the attack of the contingent of Yamagata Masakage. OKUBO TADACHIKA (1553-1628) - Son of Tadayo. He fought at Anegawa and Mikatagahara. He served as a commander of Ieyasu's bodyguards during the Komaki campaign. 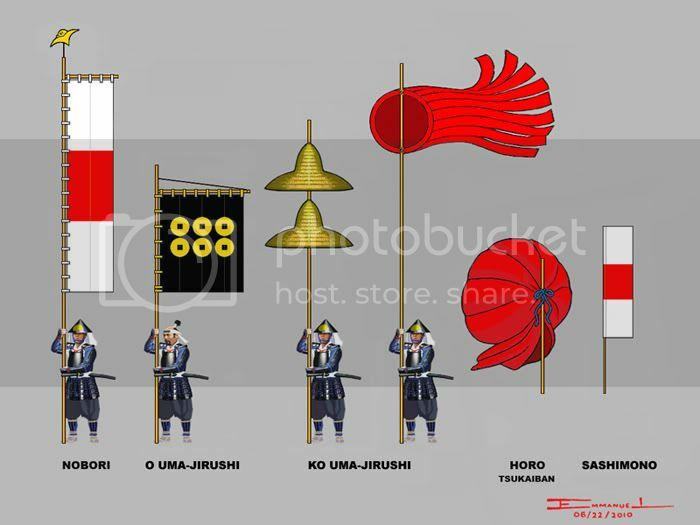 Okubo flags are clearly depicted in the Anegawa screen and are illustrated in Rekishi Gunzo heraldry books. 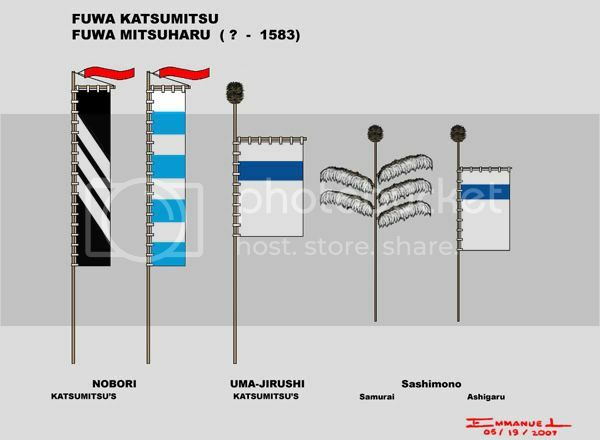 Okubo flags are described by Turnbull as black, but Anegawa screen and RG illustrations show dark blue Okubo flags. OKUBO TADAYO- Speculative portrait inspired by the Anegawa Screen. Unfortunately I don't have photos of any 'relics' belonging to Tadayo. I haven't come across any actual sample of the butterfly sashimono to know how they were constructed. The sashimono illustrated here is based on a Japanese kite whose design and shape is very similar to the sashimono on the Anegawa Screen. A small portion in low resolution of a much larger artwork titled Cherry Blossoms The original is about 2'x 2'. Tadayo riding through cherry blossom trees with Hamamatsu Castle in the background. OKUBO TADATSUNE (1580-1611) - Son of Tadachika. He served Tokugawa Hidetada during the siege of Ueda, missing the battle of Sekigahara. The banners are from O Uma-jirushi. The sashimono is speculative based on the nobori. ISHIKAWA KAZUMASA (1534-1609) - Fought in many of Tokugawa Ieyasu's battles. He led 1,000 men as commander of the third division at Anegawa. He was on the extreme left flank of the Tokugawa line at Mikatagahara. As commander of the western Mikawa force he advanced ahead of the Oda main body at Nagashino. The nobori is based on a Rekishi Gunzo color plate and appears on the Anegawa screen where the 3d uma-jirushi of the 'rindo' Ishikawa mon is also seen. The nobori with the triple streamers on top are Kazumasa's personal nobori, the simpler nobori those of his troops. Still looking for Kazumasa's sashimono, so the ones here are speculative. Ishikawa Tadafusa's sashimono might give an idea of their appearance. ISHIKAWA TADAFUSA (1572-1650) - Son of Okubo Tadachika and adopted as heir by Ishikawa Yasumichi, son of Kazumasa. During the Osaka Winter Campaign he led 300 men and took part in the operation to secure the riverside forts protecting Osaka castle. He crossed the Kizugawa to capture Bakuroguchi fort. Led 2300 men during the final Battle of Tennoji, part of the flanking move to attack Osaka castle from the northeast. Based on O uma-jirushi where the color has faded. Turnbull describe the heraldry color as green. 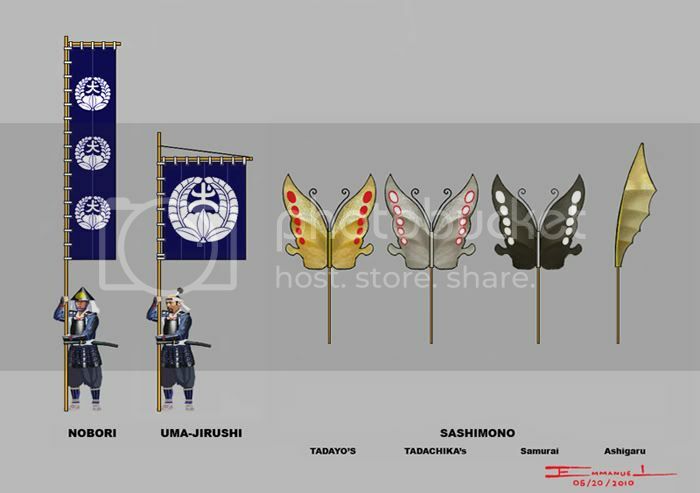 The banners use Ishikawa 'roundel' seen on Kazumasa's nobori and use what appears to be a 3d Okubo butterfly wing for the uma-jirushi.